Hi everybody! My name is Lewis Nakao, you probably know me through Facebook or met me through a Tenrikyo event like the Tenrikyo Hawaii Convention 2011. I thought I might want to share an experience with you all. I am currently working for the Tenrikyo Church Headquarters in the Overseas Department as a Hinokishin Staff since June of this year and had the opportunity to attend the the Lay Minister Preparatory Course in English. So, from August 27th to September 10th, the course was successfully held with a total of 5 students from Hawaii, Japan, Nepal, and the Philippines. The Lay Minister Preparatory Course, previously named Head Minister Qualification Course 1, underwent many changes, including the shortening of the course to three 5-day sessions and a “Group Discussion” component to the course. This was the first time this revised version of this course was held in English and is only available once a year; the Japanese course is available monthly. My father, Rev. 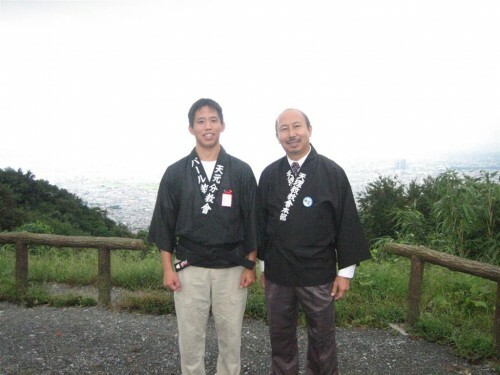 Owen Nakao, and I on the Jusan Pass. I believe I attended this course exactly when I needed it. The last time I went through a Tenrikyo course was in 2005, in the Spiritual Development Course at the Mission Headquarters of Hawaii. While I have been living near Jiba and am constantly surrounded by the teachings, I was not able to hear inspiring stories from experienced church ministers, engage in deep discussion, and listen to new insights through lectures. This was a great opportunity to be spiritually refreshed so that I could continue my duties at the Overseas Department spiritedly. It was truly a time for me to become a Lay Minister, or simply put, a Yoboku of Yobokus as I was told by a Honbu-in lecturer. 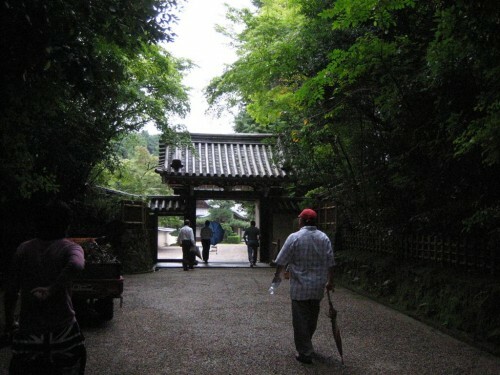 Performing the Yorozuyo on the Jusan Pass. Our main instructors, Rev. Takahiko Hayashi, Rev. Owen Nakao (my dad), and Rev. Joann Yamada (wife of Koga Grand Church head minister), were great because they included their life experiences while explaining the teachings, which brought comprehension and depth to my understanding. I was especially moved by their sincere dedication to their faith which gave me a clearer idea of the meaning of “true sincerity.” The group discussions after the lectures reinforced our understandings in sharing other perspectives that emerged from our diverse group. I felt the most important aspect of this course was the “Sermon Practice.” This was a time where I was able put my thoughts together into a meaningful message, which could be used to teach others to help them on their path of spiritual growth. I can say that this was my first time I was able to connect my personal experiences with the teachings and confidently share it with others. As a soon-to-be Lay Minister (I’m in the registration process now), I believe that this will be a very important skill in sprinkling the fragrance of the teachings to others. Overall, the course was a fairly intense 15 days of attending the morning service at the Main Sanctuary and a day full of lectures, practices, and discussions, which boosted my motivation and confidence to do missionary work for the congregation in Hawaii. If you are yearning to return to Jiba after already participating in the Spiritual Development Course at a mission headquarters or Shuyoka in Tenri City, then this course is definitely something for you to look forward to. If you are interested in attending this course, just contact your church minister or mission headquarters. They will take care of the necessary arrangements. Recommend a basic Japanese-English book to learn from? I am interested in basic Japanese conversation.